It’s time for a look at another aspect of the game – the anatomy of a player. 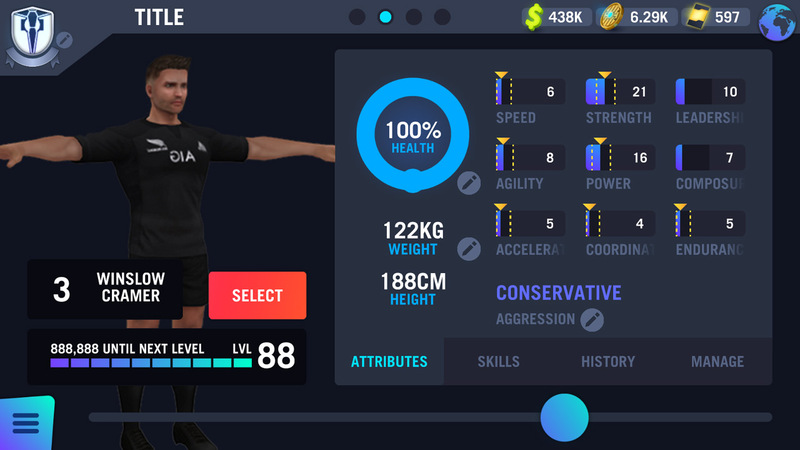 In this post we will run through the skills and attributes that define a player, and also talk a little about how these are all trained. First off, it is important to understand the difference between a player’s attributes and a player’s skills. A player’s attributes cover their physical and mental make-up. Skills, on the other hand, govern how technically proficient the player is in different technical aspects of the game. When a player tries to accomplish something on the field of play, it will be a combination of the relevant attributes and technical skills that shape how effective the player will be. Attributes and technical skills are trained in different ways, which will be made clear as we begin to cover the different systems. We will have a look at attributes first – what they cover and how you train them. After that we will turn to what technical skills a player is rated for and how these are trained. Attributes cover both physical and mental aspects of a player, not directly attached to any one sport. The Physical attributes of a player obviously include their height and weight, but also cover their Strength, Power, Speed, Acceleration, Agility, Coordination, and Endurance. The mental attributes cover a player’s Aggression, Leadership and Composure. Helps in finishing line-breaks and catching opponent’s line-breaks. A player has higher speed without the ball than with it. Also helps with distance made over time in general play, i.e. how fast they can return to position. Helps in making line breaks, as well as defending them. Helps with directional changes e.g. when on defence and a ball is chipped through the defensive line. Also helps in general play with getting up to speed to meet an attack or get in to position. Helps in beating defenders, getting up off ground quickly, lineout jumping, competing for high balls, and quickly moving the ball from ground to pass, catch to pass, and catch to kick. How strong a player is. Helps in team-to-team contact – scrums, mauls, etc. How fast a player can use their strength. Helps in player-to-player contact – tackles and breaking tackles. Helps in actions with the ball – passing, catching, kicking and throwing. Governs how slowly all other physical and mental attributes deteriorate during a match. Also has an affect on chance of injury. Low endurance = higher chance of injury. Helps with strength and power positively, and endurance and acceleration negatively. Can be adjusted up and down through nutrition. Helps with lineout jumping and competing for high ball. Affects speed positively & agility negatively. Cannot be adjusted (bar through surgery!!). A scale between low aggression/high discipline, and high aggression/low discipline. High aggression helps with rucking and tackling, but increases the risk of ruck penalties and dangerous tackles. Aggression can be influenced only through rare playing cards. Helps with captaincy, and gives a general bonus to defence. Leadership is improved through match experience, being given leadership responsibility, and can also be boosted through rare playing cards – these cards represent things like leadership courses. Helps with performance under pressure. As pressure grows, coordination, passing, catching, kicking, etc. will be negatively affected by lesser amounts if composure is high. Composure grows through playing matches and through high pressure phases of play. Now we know what the attributes cover, it is time to have a look at how they are trained. Mental attributes cannot be trained directly – they are improved in ways we mentioned above. Weight can also be raised and lowered through nutritional plans, but only by so much either way from their natural weight. That leaves the physical attributes – the real training of attributes, focusing on the seven core physical attributes: Speed, Acceleration, Agility, Strength, Power, Coordination and Endurance. Every player has a natural average for these physical attributes, and this average will vary between players – some players are naturally faster than others, some stronger and so on. These averages improve as the player ages towards physical maturity and then decline as the aging process starts to kick in. As in real life, it is impossible to train all physical attributes to the maximum all at the same time – if a player concentrates their training time on certain physical attributes, then the ones taking second place will suffer in comparison. This is represented in the game through the attribute training system. 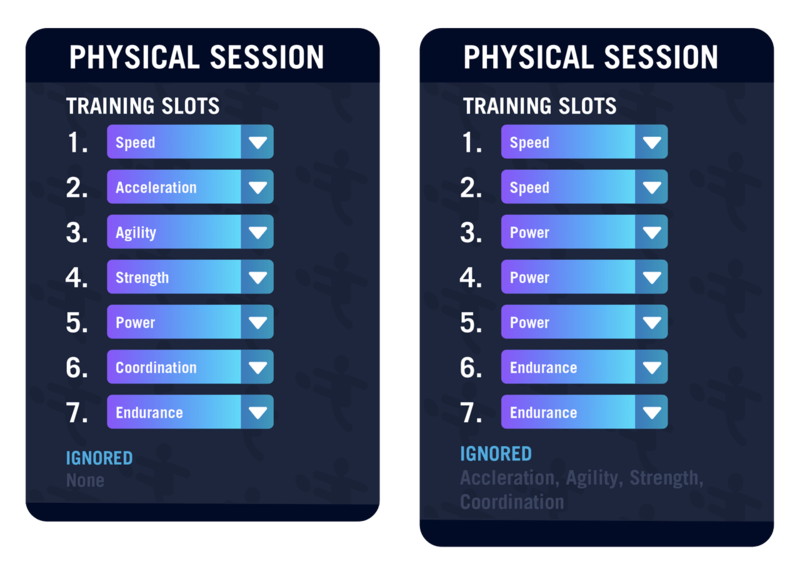 Each player has seven training slots within a daily session that are used to train one physical attribute per slot. 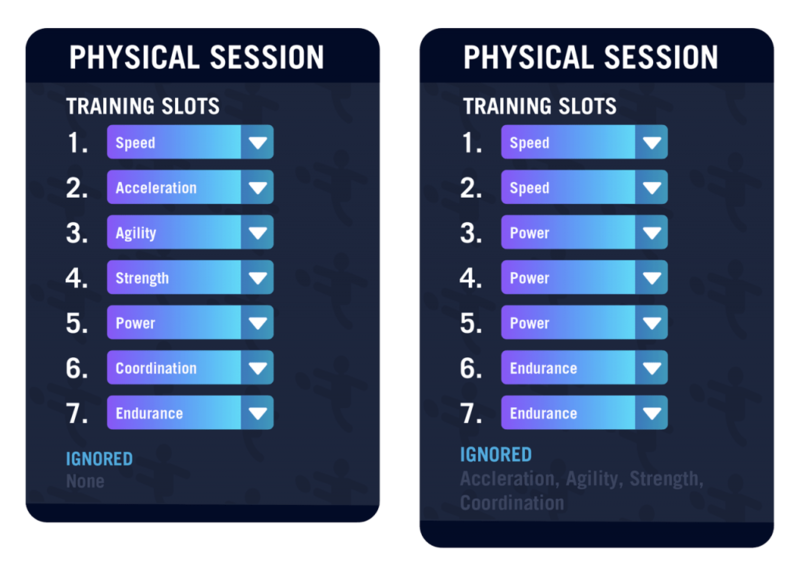 Each slot represents a period of training time, and the manager fills each one with whichever physical attribute they want. A manager can choose to have each slot have a different attribute assigned to it, or could choose to have multiple slots assigned to the same attribute. If a physical attribute has one slot assigned to it, then the attribute will stay at its average, or start drifting back to average if the attribute has risen or fallen from that average previously. If an attribute has multiple slots assigned to it then the attribute will start to rise above its average, and if an attribute has no slots assigned to it, then it will start to sink down below the average. There is a cap on how high above, or how low below, the average an attribute can go. The more slots assigned to an attribute, the faster it will rise towards this cap. So there are managerial choices the manager will have to make when it comes to training the physical attributes of their players. Many players will function perfectly on a default all round set-up, keeping to their average, but some players may want to specialise their training regime a bit, to raise some attribute(s) above their average, but there will be a cost. An example – a prop may well want to maximise their strength and increase it above their average level. However, for each additional slot assigned to strength the manager will have to lay another attribute aside, having no slot assigned to it. In this example, the manager assigns three slots to training to strength. This means that two attributes will not be able to have a slot assigned to them. In this case the manager decides the prop can do without assigning a slot to speed and acceleration. 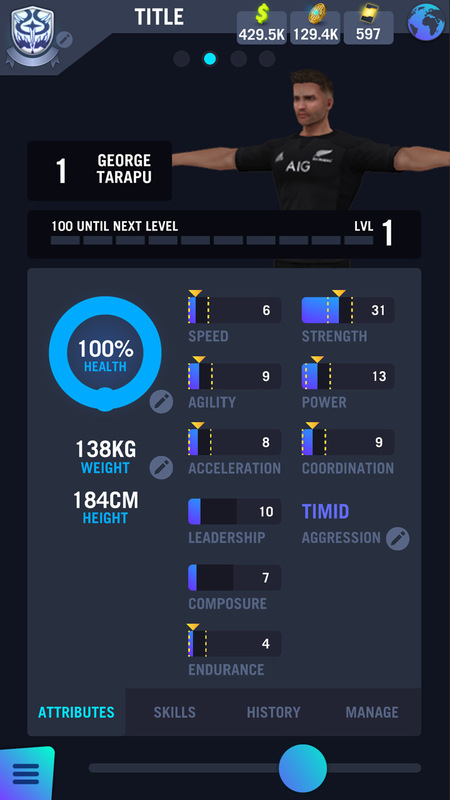 As a result the prop will see his strength rise above their average towards the maximum cap, while speed and acceleration will begin to drift below average until they hit the minimum cap. A quick note on micro-managing attribute training. While the above sounds like you will be having to continually monitoring every player’s development and setting up different regimes for every player, there are tools to make all this simpler if the manager doesn’t want to indulge in this level of micro-management. Training sessions can be set up where the various slots are assigned to attributes; multiple daily sessions can be planned to create a regimes, and then multiple players can be assigned to these regimes, allowing multiple players to all be trained in the same way – a manager just sets up the regime how they want it and assign the players to that regime. A manager can have multiple regimes at the same time for different groups of players, and there is a default all-rounder regime pre-set up with every attribute assigned a single slot. Rucking skill covers protecting the ball in a ruck when your side takes the ball into. It helps generate good, quick ball for the attacking side and combats the opposition’s attempts to steal the ball. Really the reverse of Rucking. This skill is used by the defending team in a ruck situation and is used to slow down the attacking ball and increases the chances of stealing the ball and achieving a turnover. This skill covers both attacking with the maul and in defending against it. This skill determines how effective the player is in the technical aspects of the scrum. While the scrum skill is important for all forwards taking part in a scrum, in some positions the contributions are greater, for example, the props and locks. 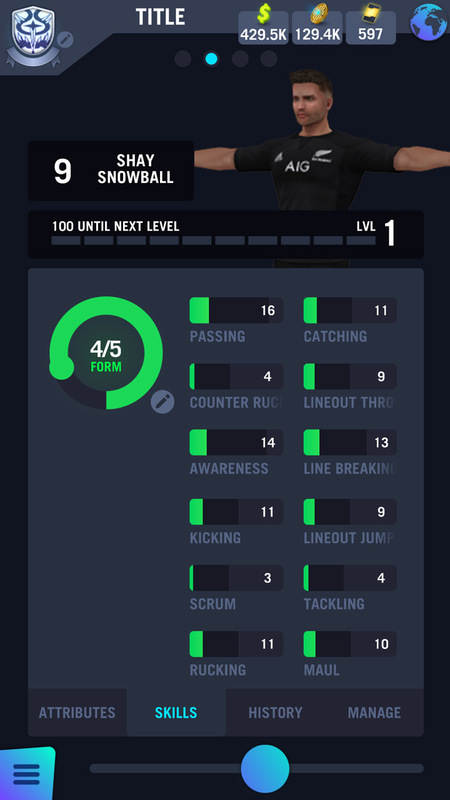 As it says, this skill covers jumping for the ball in the lineout, both in trying to win your own ball in the lineout and in trying to steal or disrupt the opposition ball. A skill specifically for hookers, though all players will have a rating. This covers throwing the ball into the lineout. The higher the skill, the greater the chance your jumpers will be able to twin the ball. Again, pretty self-explanatory – governs how good the player is in passing the ball. A key skill for a scrum-half, but all backs need to be good at it, and forwards as well if you can manage it. Catching covers two areas. The first is catching passes aimed at the player. The second is the ability to catch high balls kicked to the player. This skill covers both place kicking and kicking out of hand. While running with the ball, linebreaking involves equal parts spotting gaps to run through, and breaking through the defence once at the line. This skill deals with tackling an opponent with the ball. A key defensive skill. Awareness covers spotting gaps in the defence from a leadership perspective, and distributing the ball appropriately to exploit any developing holes over a series of phases. It is an important skill for scrum half and fly half positions. Unlike attributes, skills are not affected by age. A player may lose their physical capabilities but they don’t lose their technical skill abilities. Each player begins the game with a baseline rating in each skill, which represents their natural talents in those skills. This baseline rating determines the maximum skill the player can ever achieve in that particular skill through training. So time now to move onto how skills are trained, which means discussing training regimes and training sessions. Similar to training physical attributes, training players in technical skills is accomplished by assigning them to training regimes. The main difference being how the sessions themselves function. A club can have a number of regimes operating at any one time, and all players will be assigned to one regime or another if they want to receive any training. Each regime lasts a number of days, with a number of different durations available to the manager, dependent on the training tech advances the club has made. Each day in the regime is slot, and each training slot can have a single training session assigned to it. For example, a three day training regime will last three days and so has three training slots, one for each day. Each of these slots will be filled with a training session chosen by the manager. Once a manager has created a training regime they then determine which training session will be run in each daily slot. A manager will have access to a variety of training sessions to choose from, the exact amount depending on the training tech advancements the manager has invested in. These sessions vary from general sessions covering all forward or all back skills, through positional sessions concentrating on skills relevant to the chosen position, to specialist sessions that concentrate on a very small number of skills. The fewer the skills a session covers, the greater the training benefits to those specific skills. Once a manager has set up a number of regimes and assigned the training sessions to them, the manager must then assign players to those regimes. Multiple players can be assigned to the same regime, or a manager can set-up a regime and only assign a single player to it – it is totally up to the manager. An example may help explain the training process in actions. A manager wants to give a selection of their forwards some training in the skills especially important to forwards, with an emphasis on improving the scrum skill. To accomplish this the manager creates a three day training regime. This regime, therefore, has three training slots for the manager to fill with training sessions. The manager decides to have the training slot on day one being filled with a ‘General Forwards’ session, which will train all the skills that forwards find useful. For the session slot on day two of the regime the manager assigns a ‘Prop’ positional session – while it is called a prop session, the skills the session covers (like Scrum and maul and so on) are useful to all forwards, not just to props. While some skills useful to forwards won’t be covered, as the session covers fewer skills, the more intense training in the skills that are covered will bring greater benefits. For the final session on day three of the regime the manager decides to assign a specialist session that focuses on the Scrum skill. This specialist session covers even less skills than the Prop session on day two, but the gains from that session will be greater in the skills that are covered. With the regime now set up the manager assigns which players in their squad they want to take part in that regime, and then the training regime will run automatically every day, one session a day. The regime the manager has created will coach the players involved in a variety of skills relevant to forwards, but the biggest gains will be on skills important to props, especially the scrum skill. As is hopefully clear, there are is a wide variety of different training options open to the manager when it comes to training the skills of their players, and a wide variety of ways players can be trained – a manager could decide to simplify it all and just put all their forwards into regimes that run ‘General forward’ sessions and their backs into the back equivalent. This would not be bad, and the manager would be creating a squad full of good all-round players, suited to playing as a forward or as a back. A manager, however, who wants to shape a player’s training for a specific position can do so easily, limited only by their ability to organise and set-up the training regimes. So there you have it, a quick overview of the anatomy of a player and how a manager goes about training them. There are other aspects not covered here, from how youth players are recruited and trained, to the tech options that become available over time through infrastructure investment. There are just a couple more things, however, we will mention quickly before we sign off. The first is star players, and the second is how training fits in with the card system. Some players are born to be stars. In the game such players are rare, but every club will have a smattering of them. Such players improve and mature quickly and can reach heights in their main skills that your average player won’t. Managers will know which players are stars or not, and will obviously cherish and nurture them carefully. However, star players also recognise their own potential and will demand contracts that reflect it, so produce greater financial demands and therefore limitations on the club than other players. As mentioned in a previous blog post, there are training cards. Every training session that a club runs can have a training card played on to it. Cards played in this way give a small training bonus to the skill mentioned on the card, regardless of whether that skill is being taught in that session or not. However, some skills in training sessions are termed key skills, and if the skill on the card matches the key skill on the session then a training synergy bonus is gained, which is a slight increase in the effectiveness of the card. An example will hopefully make this easier to understand. Suppose a manager plays a ‘Passing’ training card onto a training session that does not teach passing. All players in that session will get a small passing training bonus i.e. their passing skill will improve slightly. 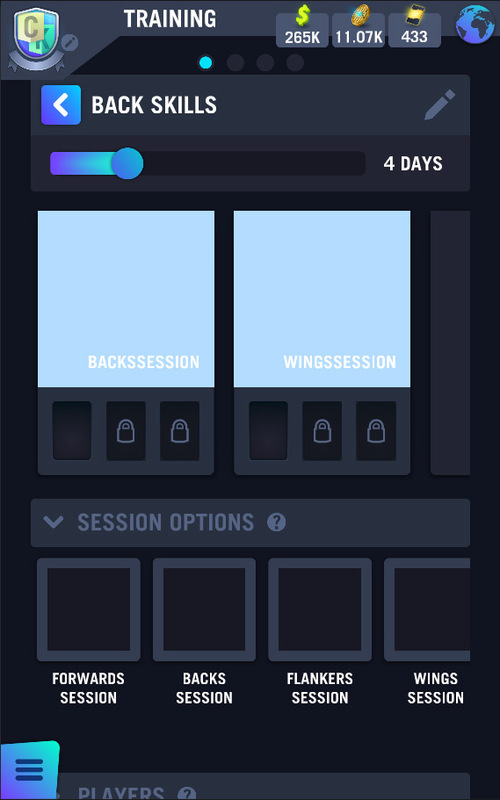 However, if the session the card was played on has the passing skill as one of its key skills, then a synergy bonus would be gained and all players in that session would get a slightly larger bonus to the passing training. So these cards are like the icing on the cake, not the cake itself. The actual training sessions determine the level of training various skills receive, while any cards played onto those sessions just add a training bonus to specific skills. 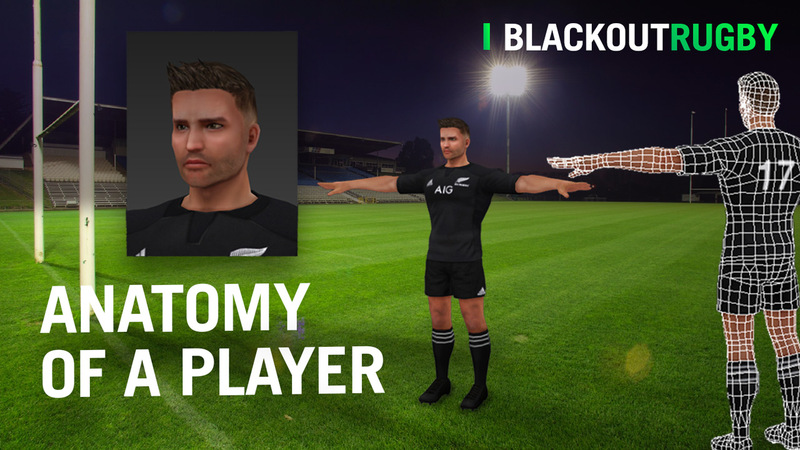 Blackout Games is a small studio from Hamilton New Zealand with a passion for sports manager games. 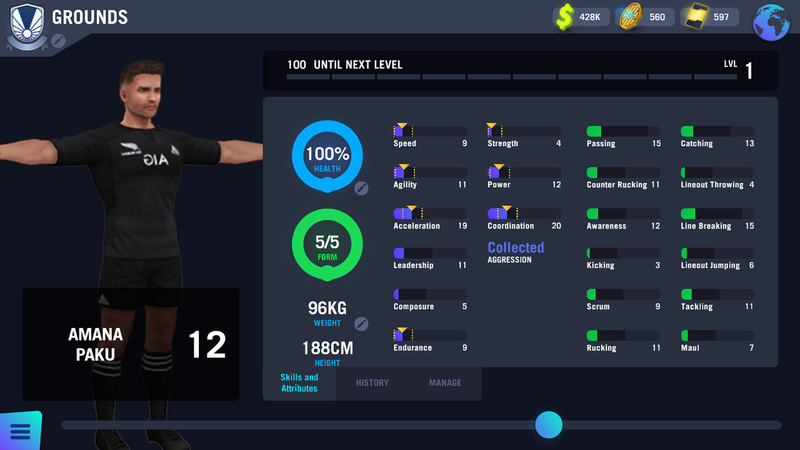 We have been running BlackoutRugby.com for over 10 years and now we are working on a brand new platform to support the future of our games.